As a Consumer Advocate and 30-year veteran of the carpet business, I know how difficult it is to choose new carpet wisely and get a fair & square deal. I hand-pick my carpet dealers using my own special set of strict requirements. 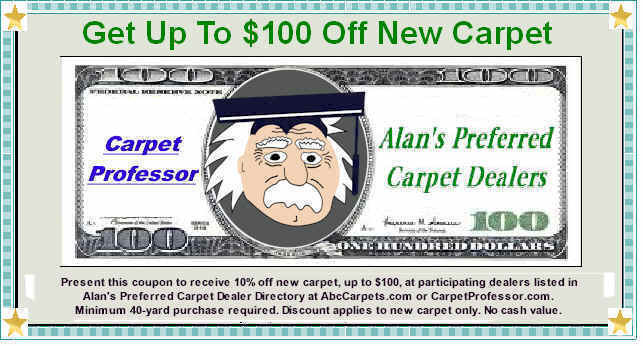 You may have to drive a little farther to visit one of my Preferred Carpet Dealers but it will be well worth the trip! Be sure to print out and present my $100 off coupon when you arrive. I find that most locally owned carpet dealers provide excellent service and are very helpful. They stand behind their products & workmanship and will go the extra mile to make sure you are completely satisfied with your purchase from start to finish! Have you seen the cost of new carpet lately? Buying new Carpet is a major homeowner expense and you deserve to be treated right, get honest advice and a fair & square deal! I want to hear about your Carpet shopping experiences. I need your comments and suggestions to help make my service better for all my readers. Email me your questions as often as you like. 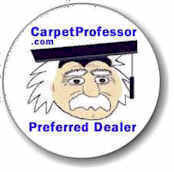 Let me help you choose carpet wisely, avoid scams and show you how to get a great carpet deal.